Tom Clancy's Rainbow Six: Rogue Spear is a tactical first-person shooter video game developed and published in 1999 by Ubi Soft Milan and Red Storm Entertainment. It is the sequel to 1998's Rainbow Six game based on the Tom Clancy novel of the same name. Rogue Spear is based on the same game engine and features gameplay and presentation similar to that of the original Rainbow Six. The game pits the counter-terrorist unit, Rainbow, against global terrorist organizations that in some cases have taken hostages or have armed themselves with weapons of mass destruction. Rogue Spear focuses on realism, planning, strategy and teamwork. 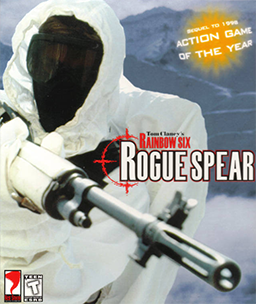 Tom Clancy's Rainbow Six: Rogue Spear was released for Microsoft Windows on August 31, 1999, with versions for the Mac OS (2000), Dreamcast (2000), PlayStation (2001), and Game Boy Advance (2002) released later. A PlayStation 2 port was also announced at the time, but it was later canceled. Following the collapse of the Soviet Union in 1991, the economic situation in Russia and the former Eastern Europe falls into chaos. Terrorism in the region is commonplace as people fight a seemingly endless stream of battles for supplies and other necessities. In this power vacuum though a dangerous a situation arises: the Russian mafia has begun buying up surplus military equipment with the assistance of current members of the Russian Army. During one such arms deal Rainbow forces raid the meeting grounds and recover weapons grade plutonium, tracing the missile material to an Arctic naval base. As it turns out, one boss in the Oil Mafia has been supplying arms and intel to various small-time terrorist groups whose international attacks Rainbow has had to deal with: A hostage situation at the Met in New York City, the attempted bombing of a tanker in the Sea of Japan, an airline hijacking in Brussels, and the neofascist takeover of a London TV station. But after the hijacking, an anonymous informant who has seen that this terror campaign has gone too far supplies information to Rainbow on who's behind the attacks and where his men will strike next. A subsequent investigation reveals that the plutonium deals are part of a plan between a Russian organized crime boss named Maxim Kutkin and Azeri arms dealer Samed Vezirzade. These two men intend to use the plutonium purchased from the military to create suitcase sized nuclear weapons through the use of abandoned Russian military facilities, then distribute these weapons to terrorists on the black market. To prevent any instance of nuclear terrorism, Rainbow mobilizes against both parties, raiding the nuclear weapons production facility and intercepting two separate meetings between the mob and potential buyers with the aid of a dissident group of the Russian mob. In the final two missions Rainbow zeros in Vezirzade's base of operations, raiding his fortress and killing him after an attempt to bring him in alive fails. In the aftermath of Vezirzade's death, Kutkin realizes that the overall plan to manufacture and sell nuclear weapons has failed, and seeks vengeance for the collapse of the arms deals. With the assistance of a small number of men loyal to him, Kutkin seizes control of a commercial nuclear power plant and threatens to shut off the cooling system for the reactors, which would result in a nuclear meltdown. To prevent a potential repeat of the Chernobyl disaster, Rainbow forces storm the plant and manage to recapture the facility intact. In the final debriefing, Kutkin is confirmed to have been killed in the raid. His mansion in Russia is acquired by the "Russian Godfather", whose assistance had been vital during Rainbow's operations (it turns out he was the anonymous informant, and Kutkin was his own insane son-in-law). After arriving at the mansion, the Russian Godfather makes a short speech which is picked up by surveillance bugs planted during an earlier Rainbow intelligence operation. The godfather then shoots the bug, preventing any further monitoring of the mafia from the mansion. The term "Rogue Spear" was invented by Clancy and refers to the possession of nuclear weapons by a non-state entity, equivalent to the official terminology Pinnacle-Empty Quiver. Rogue Spear’s online multiplayer consists of two modes: cooperative and adversarial. In cooperative mode, individuals team up with other players to complete missions against the computer AI in formats similar to the single-player missions. Adversarial mode pits players against one another with Survival, a mode similar to Deathmatch, and Team Survival, similar to Team Deathmatch garnering the vast majority of play. Rogue Spear does not support dedicated servers, with games being limited to sixteen players per server. An active competitive scene has surrounded the game, with players forming clans and participating in ladder play. Rogue Spear Mission Pack: Urban Operations, released on April 4, 2000, was the first expansion for Rogue Spear. It was developed and published by Red Storm Entertainment. It added eight new maps and five classic Rainbow Six maps from the original game, as well as three new weapons. Urban Operations was re-released by KAMA Digital Entertainment in South Korea - this new edition included two exclusive missions and two new weapons. With the release of Urban Operations, a built-in mod system was added to manage user-made "mods" or modifications. Rainbow Six: Covert Ops is a stand-alone expansion pack of Rogue Spear. The training simulator was developed by Magic Lantern Playware, six of the levels were done by Zombie Studios and three of the levels were done by Red Storm Entertainment. It was published by Red Storm Entertainment. It was released on September 28, 2000. It included nine new missions, because the product was primarily developed as an educational program on real life counter-terrorism history and tactics. The training simulator developed by Magic Lantern Playware was actually a Computer Based Training program. "Recruits" would create a profile, and then read educational materials such as actual military Field Manuals, view video interviews from anti-terrorist experts, take multiple-choice tests to progress in rank, and see live-fire demonstrations of the weapons included in the game. For the live-fire videos, Sergeant Anthony Levatino (now Deputy Chief) from the Santa Ana, California Police Department was contracted to provide content expertise for the educational material and for the on-camera demonstrations. Having access to all the weapons included in the game, and being a SWAT Team Leader/Sniper and SWAT Academy instructor, Sergeant Levatino provided brief weapon introductions and live-fire demonstrations. Rogue Spear: Black Thorn was developed by Red Storm Entertainment, published by Ubisoft, and released as a stand-alone add-on on December 15, 2001, featuring new singleplayer and multiplayer maps, along with new weapons and a new multiplayer game mode. The singleplayer plot features a mentally disturbed ex-SAS operative challenging Team Rainbow with reenactments of real-life terrorist attacks, such as the Entebbe Operation and the Japanese embassy hostage crisis. Rogue Spear was met with positive to mixed reception upon release. GameRankings and Metacritic gave it a score of 85.97% for the PC version; 75.77% and 76 out of 100 for the Game Boy Advance version; 72.62% and 75 out of 100 for the Dreamcast version; and 60.07% for the PlayStation version. In the United States, Rogue Spear's sales reached 240,503 copies by April 2000. In the same country, the game's Platinum re-release sold another 240,000 copies and earned $7.7 million by August 2006, after its launch in October 2001. It was the country's 85th best-selling computer game between January 2000 and August 2006. The editors of PC Gamer US named Rogue Spear the best action game of 1999, and wrote, "Congratulations, Red Storm... in a loud market, you made the quiet revolution." Rogue Spear was a finalist for the Academy of Interactive Arts & Sciences' 1999 "Action Game of the Year" award, which ultimately went to Half-Life: Opposing Force. Expansion packs of the PC version received lower scores than the original release. The most recent was Black Thorn, which currently has a score of 71.92% on GameRankings, and 67 out of 100 on Metacritic. ^ a b "Tom Clancy's Rainbow Six: Rogue Spear for PC". GameRankings. Archived from the original on September 1, 2014. Retrieved July 23, 2014. ^ a b "Tom Clancy's Rainbow Six: Rogue Spear for Game Boy Advance". GameRankings. Archived from the original on September 13, 2014. Retrieved July 23, 2014. ^ a b "Tom Clancy's Rainbow Six: Rogue Spear for Dreamcast". GameRankings. Archived from the original on October 16, 2014. Retrieved July 23, 2014. ^ a b "Tom Clancy's Rainbow Six: Rogue Spear for PlayStation". GameRankings. Archived from the original on November 28, 2013. Retrieved July 23, 2014. ^ a b "Tom Clancy's Rainbow Six: Rogue Spear for Game Boy Advance Reviews". Metacritic. Archived from the original on October 24, 2014. Retrieved July 23, 2014. ^ a b "Tom Clancy's Rainbow Six: Rogue Spear for Dreamcast Reviews". Metacritic. Archived from the original on July 14, 2014. Retrieved July 23, 2014. ^ Sutyak, Jonathan. "Tom Clancy's Rainbow Six: Rogue Spear (PC) - Review". AllGame. Archived from the original on November 14, 2014. Retrieved July 24, 2014. ^ House, Michael L. "Tom Clancy's Splinter Cell: Rogue Spear (GBA) - Review". AllGame. Archived from the original on November 14, 2014. Retrieved July 24, 2014. ^ Woods, Nick. "Tom Clancy's Rainbow Six: Rogue Spear (PS) - Review". AllGame. Archived from the original on November 14, 2014. Retrieved July 24, 2014. ^ Bye, John "Gestalt" (November 2, 1999). "Rainbow Six: Rogue Spear (PC)". Eurogamer. Archived from the original on March 4, 2016. Retrieved July 23, 2014. ^ Taylor, Martin (April 7, 2002). "Rogue Spear (GBA)". Eurogamer. Archived from the original on March 4, 2016. Retrieved July 23, 2014. ^ "Tom Clancy's Rainbow Six: Rogue Spear (GBA)". Game Informer (109): 89. May 2002. ^ "Tom Clancy's Rainbow Six: Rogue Spear (DC)". Game Informer (94). February 2001. ^ Nash Werner (September 29, 1999). "Rainbow Six Rogue Spear Review for PC on GamePro.com". GamePro. Archived from the original on February 14, 2005. Retrieved July 23, 2014. ^ Four-Eyed Dragon (March 11, 2002). "[Tom Clancy's Rainbow Six] Rogue Spear Review for Game Boy Advance on GamePro.com". GamePro. Archived from the original on January 18, 2005. Retrieved July 23, 2014. ^ Johnny B. (October 1999). "Rainbow Six: Rogue Spear - PC Review". Game Revolution. Archived from the original on September 5, 2008. Retrieved July 23, 2014. ^ Dodson, Joe (January 2001). "Rainbow Six: Rogue Spear Review (DC)". Game Revolution. Archived from the original on September 19, 2015. Retrieved July 23, 2014. ^ Ryan, Michael E. (September 30, 1999). "Tom Clancy's Rainbow Six: Rogue Spear Review (PC)". GameSpot. Archived from the original on June 18, 2003. Retrieved July 23, 2014. ^ Wolpaw, Erik (December 14, 2000). "Rogue Spear Review (DC)". GameSpot. Archived from the original on June 21, 2015. Retrieved July 23, 2014. ^ Lopez, Miguel (April 1, 2002). "Tom Clancy's Rainbow Six: Rogue Spear Review (GBA)". GameSpot. Retrieved July 23, 2014. ^ Rivers, Trevor (April 6, 2001). "Rogue Spear Review (PS)". GameSpot. Retrieved July 23, 2014. ^ Fargo (October 1, 1999). "The Joys of Anti-Terrorism". GameSpy. Archived from the original on August 23, 2004. Retrieved July 23, 2014. ^ Hudak, Chris (April 22, 2002). "Tom Clancy's Rainbow Six: Rogue Spear (GBA)". GameSpy. Archived from the original on March 1, 2005. Retrieved July 23, 2014. ^ Mr. Domino (September 7, 2000). "Rainbow Six: Rogue Spear". PlanetDreamcast. Archived from the original on January 25, 2009. Retrieved July 23, 2014. ^ Da bomb mom (January 15, 2001). "Tom Clancy's Splinter Cell: Rogue Spear Review - Dreamcast". GameZone. Archived from the original on October 6, 2007. Retrieved July 23, 2014. ^ Lafferty, Michael (October 4, 1999). "Tom Clancy's Rainbow Six: Rogue Spear Review - PC". GameZone. Archived from the original on March 7, 2008. Retrieved July 23, 2014. ^ Blevins, Tal (September 24, 1999). "Rogue Spear (PC)". IGN. Archived from the original on March 21, 2015. Retrieved July 23, 2014. ^ Butts, Steve (April 9, 2002). "Rainbow Six: Rogue Spear (GBA)". IGN. Archived from the original on December 19, 2012. Retrieved July 23, 2014. ^ Chau, Anthony (December 6, 2000). "Rainbow Six: Rogue Spear (DC)". IGN. Archived from the original on May 19, 2014. Retrieved July 23, 2014. ^ Smith, David (April 9, 2001). "Tom Clancy's Rainbow Six: Rogue Spear (PS)". IGN. Archived from the original on April 26, 2015. Retrieved July 23, 2014. ^ "Tom Clancy's Rainbow Six: Rogue Spear". Nintendo Power. 154: 135. March 2002. ^ "Tom Clancy's Rainbow Six: Rogue Spear". Official U.S. PlayStation Magazine. 2001. ^ Harms, William (August 2000). "Tom Clancy's Rainbow Six: Rogue Spear". PC Gamer. Archived from the original on January 10, 2006. Retrieved July 23, 2014. ^ a b "Tom Clancy's Rainbow Six Rogue Spear: Black Thorn for PC". GameRankings. Archived from the original on October 12, 2014. Retrieved July 23, 2014. ^ a b "Tom Clancy's Rainbow Six Rogue Spear: Black Thorn for PC Reviews". Metacritic. Archived from the original on October 13, 2015. Retrieved July 23, 2014. ^ Taylor, Martin (November 8, 2001). "Rogue Spear : Black Thorn". Eurogamer. Archived from the original on March 4, 2016. Retrieved July 23, 2014. ^ Wolpaw, Erik (November 12, 2001). "Tom Clancy's [Rainbow Six] Rogue Spear: Black Thorn Review". GameSpot. Archived from the original on November 19, 2013. Retrieved July 23, 2014. ^ Chick, Tom (November 25, 2001). "Rogue Spear: Black Thorn". GameSpy. Archived from the original on June 11, 2004. Retrieved July 23, 2014. ^ Butts, Steve (November 13, 2001). "[Tom Clancy's Rainbow Six] Rogue Spear: Black Thorn". IGN. Archived from the original on January 28, 2013. Retrieved July 23, 2014. ^ "Tom Clancy's Rainbow Six Rogue Spear: Black Thorn". PC Gamer: 73. January 2002. This page was last edited on 25 February 2019, at 23:22 (UTC).